The folk rock band are topping the bill for the festival's Pyramid Stage this summer and told Time Out it is the biggest risk they have ever taken. Marcus Mumford said: "It's a really huge deal to headline Glastonbury: we're a young band with only two records behind us. This summer is probably the biggest risk we've ever taken." Winston Marshall admitted he was worried that they might not have enough well-known material to fill a headline slot. He said: "I've seen the Stones play for three hours and the crowd knew every song. It's what you want in a headline slot at a festival. I'm scared because it feels like a gamble. We don't know if we've earned it yet or not." Bassist Ted Dwane also said he was feeling the fear about the gig: "Last night was the first time I visualised the Pyramid Stage in my head. I hadn't made that connection before - it's actually real. It's really, really... scary." 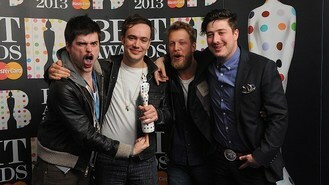 Meanwhile, Ben Lovett joked that the secret of Mumford and Sons' success could be a case of mistaken identity. He said: "Everything thinks we're Irish. There's an Irish bar in every town - it's the secret of our success."